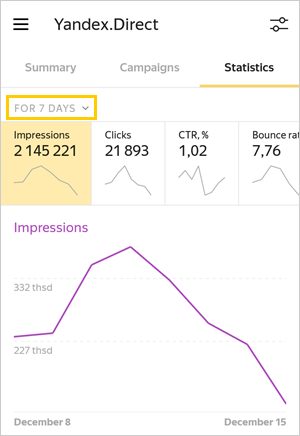 For single campaigns, ad groups, ads and keywords — tap Statistics on the corresponding screen (for example, on the campaign screen). How to select metrics to display in your statistics? 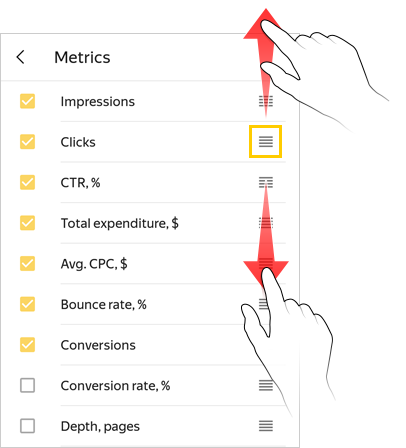 Tap → Metrics and select the items you want from the list. The metrics selection applies to all statistics screens in the app. Metrics unavailable for selection are grayed out. 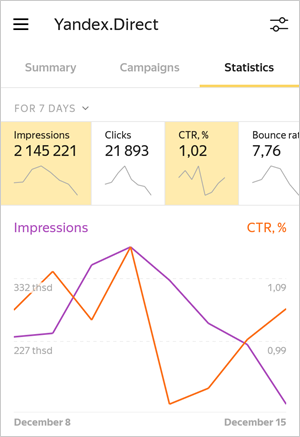 On the Statistics screen, tap , and enable the Compare metrics option. After doing so you can view two graphs at the same time, then return to statistics and select the metrics you need. You can select the appropriate data section for the statistics table. 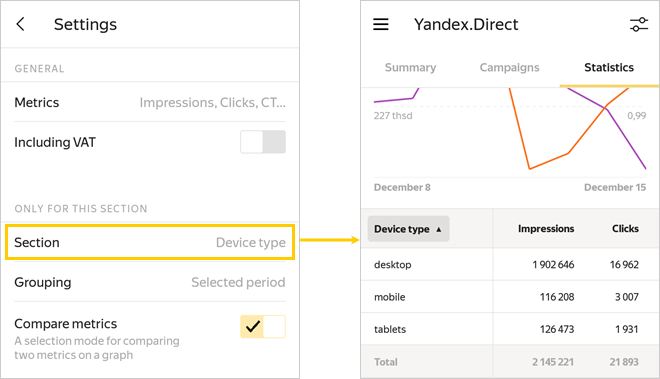 For example, if you select the Device type section, you will see impression data divided into desktops, smartphones, and tablets. The app contains data sections that are linked to your campaign settings (Campaign type, Campaign, Ad network type, Geotargeting region, Position) and data on the users that saw your ads (Region of user's location, Device type, Operating system type, Connection type, Gender, Age). To select a data section, go to the Statistics and tap → Section. You can group data in the table by time periods. For example, if you group by week, you can view data for each week separately. To select a data section, go to the Statistics screen and tap → Grouping. How do I display statistics for a given time period?How to select metrics to display in your statistics?How can I display two graphs?How do I include VAT for monetary metrics?How do I select a data section for the statistics table?How can I set up a grouping for a statistics table?How do I organize data in a statistics table?